Transfer from the airport in Cusco to the hotel. 5:45 hrs. Transfer Hotel in Cusco to the train station. Journey by train from Cusco to Aguas Calientes (4 hours). Free day (Optional: Visit to Machu Picchu on your own). Overnight at hotel in Aguas Calientes. Ascent by bus to Machu Picchu. 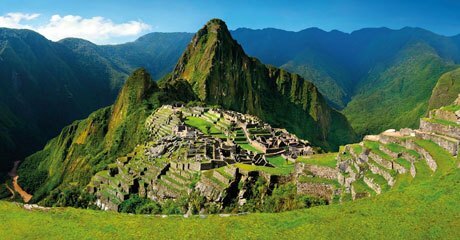 Guided tour in Machu Picchu from 07:00 hrs to 09:00 hrs. Optional: Walk to Huayna Picchu (3 hours, without guide). In the afternoon return to Cusco by train. Transfer from the train station to your hotel. Transfer from the Hotel to the Bus station - Cusco to Puno. 1 Transfer to the Tourism Bus terminal Cusco to Puno. 1 Transfer from the hotel in Puno to the airport of Juliaca (1 hour ). We will begin our tour through the modern residential districts of Miraflores and San Isidro. We will visit the financial center, the Golf, El Olivar, the Huaca Pucllana (the pre-Inca ceremonial temple in the shape of a pyramid) and the Love Park on the Malecón de Miraflores. Continuing with our tour, we will go to the Historical Center of Lima, we will know the Plaza San Martin, its balconies and old houses, the Plaza Mayor with its most important buildings and finally we will enter one of the most important convents of the seventeenth century. A complete tour with the comfort and attention of a modern tourist service. Sacsayhuaman: Built at 3 Km. from the city of Cusco, impressive stone fortress with an excellent architecture, famous for its huge carved stones some of which are at 9 m/ 30 high,with a weigh of 350 tons. Here is where the Inty Raymi or Fiesta del Sol is held in June Every year. Third day: Free day in Machu Picchu "The Lost City of the Incas"
We will pass by your hotel in Cusco 1 hour before the departure of your train, and take you to the station, located in the town of Poroy, then we board the train of the company "PERURAIL" and begin the journey from Poroy - Cusco to the town of "Aguas Calientes" (2000 m) which has a duration of 4 hours. Upon arrival at Aguas Calientes, we will go to our hotel, our guide will look at night to provide information needed for the day of your tour, if you wish you can visit the Hot Springs or buy crafts of place. Early in the morning the next day we go to the bus station to climb 400 meters high, by a zigzag way for 30 minutes to reach the incredible wonder of the world "The Sanctuary of Machupicchu", known as "The City lost of the Incas "When you reach the citadel of Machu Picchu, we pass the control, where our tickets will deliver revenue and begin our guided tour, visiting the Main Plaza, the Circular Tower, the Sacred Solar clock, the royal quarters, the temple of the Three Windows and various cemeteries around for more than two hours. Optional: you can do the trekking to the summit of Huaynapicchu or the Mountain sector, this will take a few hours, in which you can enjoy the scenery and take some breathtaking views (This visit is without a guide). In the afternoon we will take the bus back to Aguas Calientes and head to our hotel, to take bags, and come to the station with anticipation to return to Cusco where we will be waiting at the station Poroy to transfer you to your hotel. Tour to the Sacred Valley of the Inkasthis tour starts around 09:00 hrs., we pick you up at your Hotel, we have a guided tour to the Sacred Valley of the Incas, over the Vilcanota river, with a panoramic view of Pisac an old Inca City and a visit to the Inka market in this village, where we will have the chance to know in a closer way its people customs and get good bargains with the handycrafts and souvenirs sellers, afterwards we'll head for Urubamba, traveling on the borders of the river Vilcanota. TOURIST TRIP FROM CUSCO TO PUNO, VISITING RAQCHI After breakfast, we will drive you to the bus station to start with our trip to Puno this a tour lasts around 8 hours you will have 4 guided visits, Andahuaylillas's temple or South American Sixtine Chapel , the Inka temple of Raqchi, Buffet lunch in Sicuani,La Raya at 4335 m.a.s.l and the Inka Aymara museum of Pukara. Every visit has a duration of 20 or 40 minutes, where the passenger will be able to make questions, take photos and walk a for a while, doing our trip very pleasant. Then we wll arrive in Puno, and our staff will take you to the Hotel. (Photo: Raqchi). CHULLPAS OF SILLUSTANI AND FLIGHT JULIACA TO LIMAAfter Having breakfast and once we're ready we will head to Juliaca's Airport (1hr from Puno), but on the way to the Airport we will visit the Chullpas of Sillustani for around 30 minutes.The archaeological site of Sillustani is located 22.3 miles away from the city of Puno (34 Km., 35 minutes drive) and at an altitude of 12,858 feet (3,840mts.) above sea level. This visit allows visitors to enjoy stunning highland landscapes and imposing pre-Inca architecture. The site is strategically positioned on the top of a peninsula surrounded by a beautiful lagoon called Umayo lagoon. TOURIST TRIP FROM LIMA TO NAZCA This trip starts around Noon, so you will have free time in the morning to have walks around Lima at an agreed time our staff will pass by your Hotel to drive you to the Bus Station to Nazca, you will travel through the coast, in Nazca a local guide will be waiting to take you to the Choosen Hotel. (Photo: Raqchi). Tenth day: On flight to the "Nazca Lines"
In the morning, having breakfast, we will transfer you to the Nazca airfield, for a 45-minute flight over the Pampas de Nazca, where the ancient pre-Incas drew gigantic figures of animals and plants with a purpose not yet discovered, many believe that these figures were made by extraterrestrials, among which are the monkey, the spider, the hummingbird, etc. In the afternoon we will take a bus to Paracas, a city 2 hours from Nazca, in Paracas we will spend the night. (Photo: Spider of the Nazca Lines). Eleventh day: Tour to the "Islas Ballestas" and "Reserva de Paracas"
After having our breakfast, we will move to the port of Paracas, where we will start the tour to the Ballestas Islands passing through "El Candelabro" a giant image on the side of a hill. Upon arrival at the Ballestas Islands, you will visit the different islands for two hours, observing different species of sea lions, seals, penguins and guano birds. After arriving at the port we will make the tour to the Paracas reserve. In the afternoon we will go to Paracas from where we will take the bus to Lima. Upon arrival in Lima, we will wait for you at the bus terminal and transfer you to the airport to make your flight arrangements to your country, there we will say goodbye. (Photo: Ballestas Islands in Paracas).